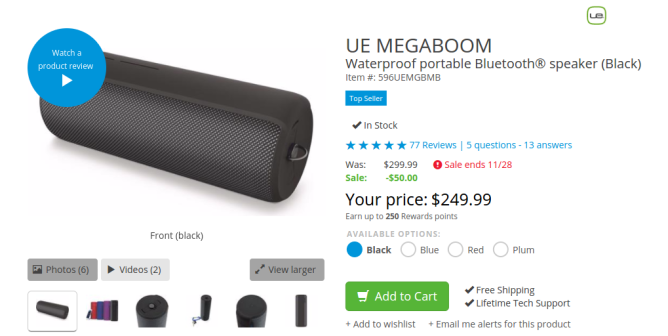 The UE MEGABOOM speaker doesn't just go boom. It goes megaboom. That explosion you hear is the sound of a cylindrical Bluetooth speaker pumping music in all directions. It's not on your desk yet, but you can hear it already, and right now you can make it happen for $50 less than usual. The UE MEGABOOM is currently reduced down to $249.99 on Amazon, BestBuy, Crutchfield, and Newegg. Each of the sellers except Newegg has the device in black, blue, purple, and red. Crutchfield says its sale will end on the 28th. eGlobalCentral has the MEGABOOM for even less. Buyers can pick one up there for $219. You can go four dollars even lower by ordering the speaker from someone on eBay, but the seller is shipping from overseas, and there's the risk it's counterfeit. Still, the option's there if you want it. If you have the money to burn and want more than one, Ultimate Ears lets you connect and play music through up to ten speakers at the same time. If you're sticking with one because who has the money to buy a bunch of $250 speakers right now, the included "Block Party Mode" lets you connect up to three devices to the speaker at once. Either way, the UE MEGABOOM Android app leaves you with plenty to tinker with, so I'll link it below.